Circa 1978. 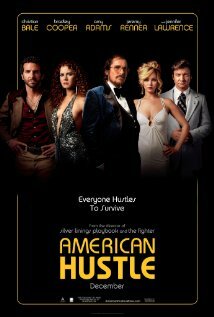 Skillful con artists Irving Rosenfeld (Christian Bale) and Sydney Prosser (Amy Adams) cut a deal with FBI agent Richie DiMaso (Bradley Cooper) to catch other swindlers in return for clemency. But Irving is having an affair with Sydney, and his wife (Jennifer Lawrence) is a loose cannon, creating a powder keg of a situation that could derail the whole sting. Nominated for several key awards at the Oscars this year, namely the coveted Best Picture, this film has been given a lot of positive press. Writer/Director David O’Russell has delivered fine films, such as The Fighter and Silver Linings Playbook (and the leads, here, were in those films, too) but this isn’t as good as it’s touted to be. Sure, the actors are charismatic and capable, the production design is entertaining, the soundtrack is nostalgic, and there are fun costumes, as well as a lot of time devoted to amusing hairstyles – Bale’s disco comb-over, Coopers tiny curlers, Lawrence’s sweep – but there’s little point or suspense to this film. The elaborate plot attempts to address corruption in America, but repeatedly gets lost self consciously in its own chicanery. And who are the bad guys? Con men, errant politicians, and Mafia bosses are more likeable and upright in this film than the FBI operatives out to take them down. While the friend I watched American Hustle with relegated it to one of the most boring movies he has ever watched, I think it’s worth watching, particularly if you’re into slick visuals, and it’s definitely worth renting on DVD.